We are seeing injuries in Puerto Rico occurring when linemen are restoring power and when workers are doing hurricane repairs or rebuilding. Anyone injured under a contract with an American company should consult with this firm about getting money for those injuries. All consultations are free and there is no charge unless we obtain a settlement. 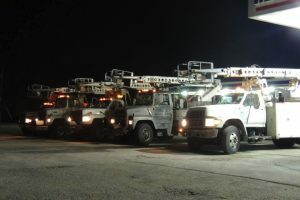 Generally the insurance company is providing benefits for the linemen or worker once they return home. The lineman or injured worker then sees a local Workers compensation attorney who applies for benefits from the State workers compensation system where they live. Once the worker recovers per the treating doctor and receives a few checks, that is generally the end of the case. But it should not be. This firm has long held the view that these are Federal Claims that must be filed in the Federal Longshore and Defense Base Act Court system. The Division has weighed in and confirmed they have jurisdiction. This firm anticipated this and opened our Puerto Rico office last year to handle these claims. Why does this firm care? The difference to an injured person on a minor hand injury can be $50,000 in Federal Court versus $15,000 in the State Workers Compensation system for a small injury. We are well equipped to handle these case with our Main office in South Florida and Our Satellite office in Puerto Rico. You have the right to choose your doctor. Please do not sign a paper saying your choice of doctor is the one the insurance company picked for you. Why? Because we can help you pick a doctor that will help you medically and financially. Why would the insurance company help you pick a doctor that would help them pay more money? Exactly. What to do now? Perhaps you are reading this and feel you need more information about the financial benefit and time limitation to have us file a DBA claim for you. Remember the consultation is always free! Even if your treatment records are in Spanish, once we accept the case and have those medical records translated, we can file those with the Division to obtain a monetary amount in settlement for those injuries. You need to obtain representation and have us file the claim within one year of seeing the medical specialist. Do not let time pass as there are statutes of limitation that will affect your financial recovery. That means doing nothing means you receive nothing financially and we don’t want that to happen. Money is good but health is everything so our goal is number one to get you out of pain and number two obtain the best settlement possible so your life can return to normal.